Well, today was the first official wing construction day. While Van’s is trying to figure out what to do with my damaged left spar, I figured I should get started on the right spar. First thing…yup…a plans change picture! 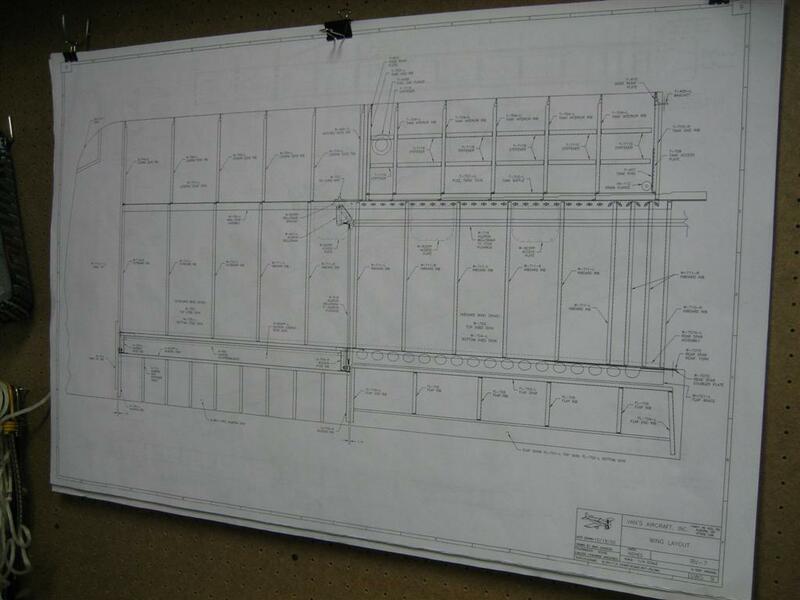 The plans for the wing are a little different. There are about 4 separate sheets of different views for the wing. You guys get to see just the general layout one. Now, let’s get to work. First thing, I very carefully put my beautiful right spar on the edge of the workbench and clamped the flange down very lightly. The spar will tip over onto the table (away from the camera) if the clamps let go, so I’m not too worried about clamping them down too much. Fine. I see how it’s going to be. 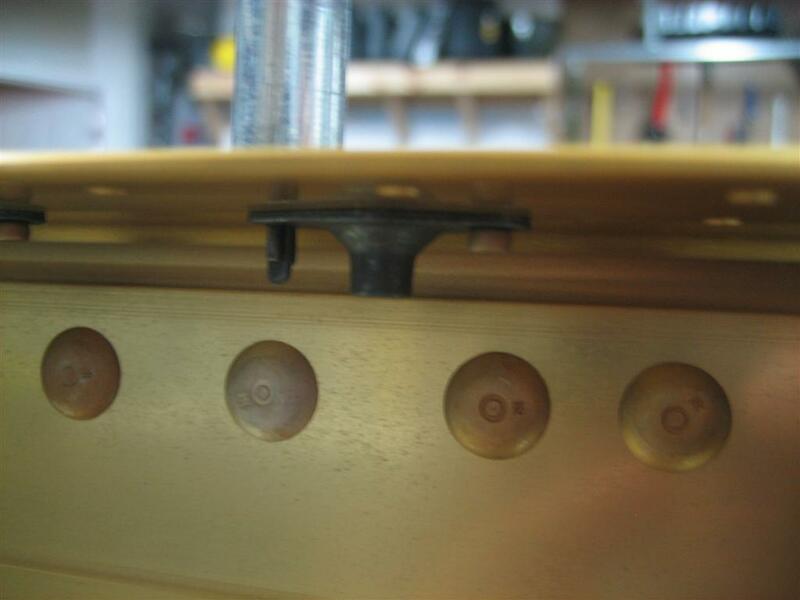 A lot of builders start out thinking they should make a nutplate jig and countersink the screw holes before riveting the nutplates (sorry Van, I call them nutplates) on so they can use the jig as a guide for the c/s pilot to avoid chatter. 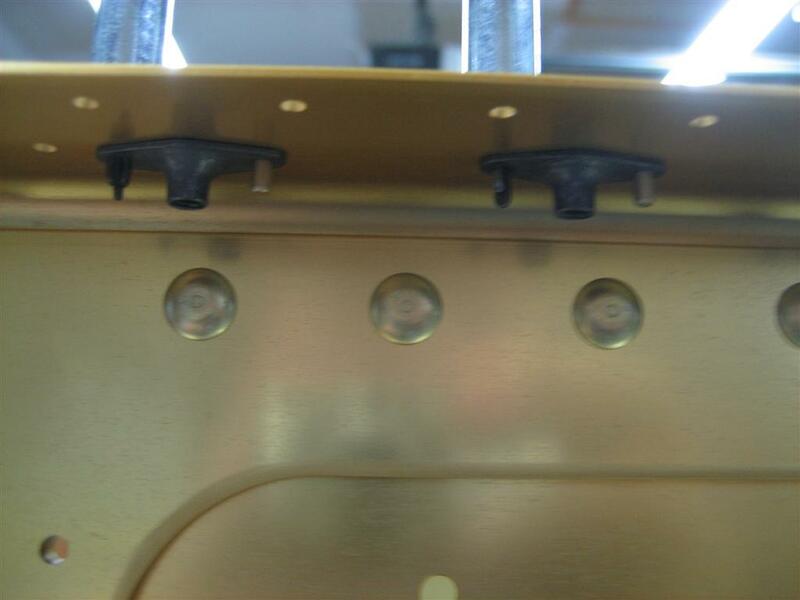 Van’s suggests using the installed nutplates as the pilot guide. After those builders spend some time making those jigs, they eventually abandon the idea and fall back to the Van’s method. I’m going to do something I don’t normally do and FOLLOW THE INSTRUCTIONS. Sometimes, I try to get cute with extra ideas and fancy engineering solutions, when really I should just do things by the book. So I grabbed my countersink with a #40 c/s bit, tested in some scrap, and positioned the countersink cage over one of the nutplate attach holes. The c/s pilot didn’t fit. What?! 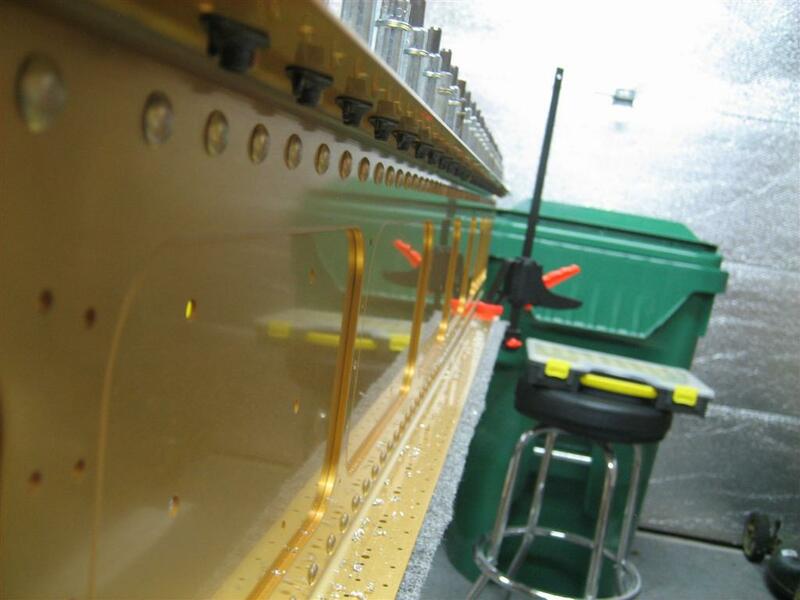 You mean I am going to have to drill all of these holes out to #40 first? Ugh! After drilling every one of the attach holes out to #40, I finally got the countersink and cage loaded back into my cordless drill (slower and more trigger feathering ability than the air-drill) and got to it. Here are my first 10 countersinks. 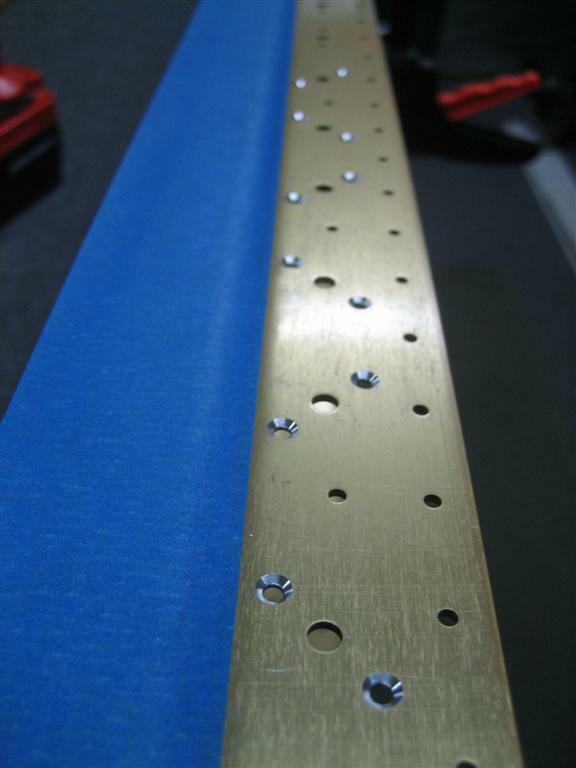 The blue tape is to prevent metal shavings from getting lodged in between the spar cap bars and the spar web. 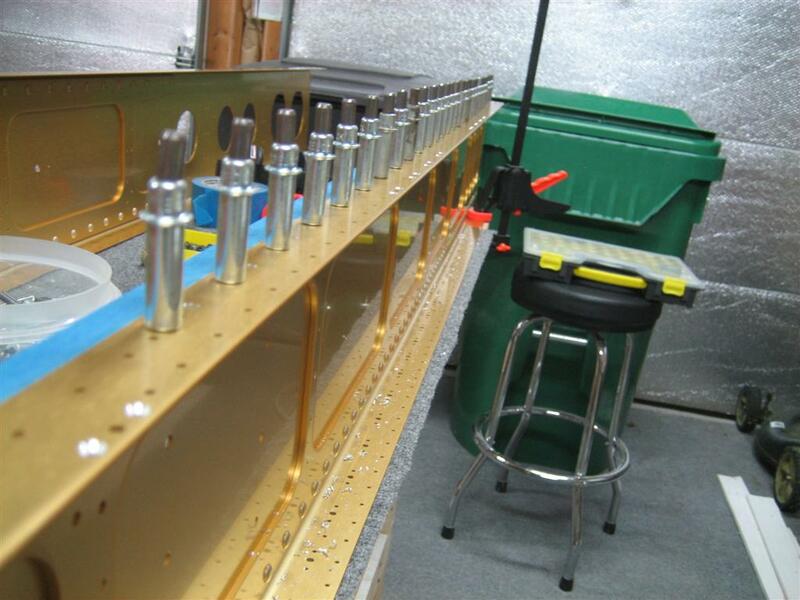 I stopped about every 6 countersinks and retested my countersink depth using a AN426AD3-4 rivet. They are all perfect. 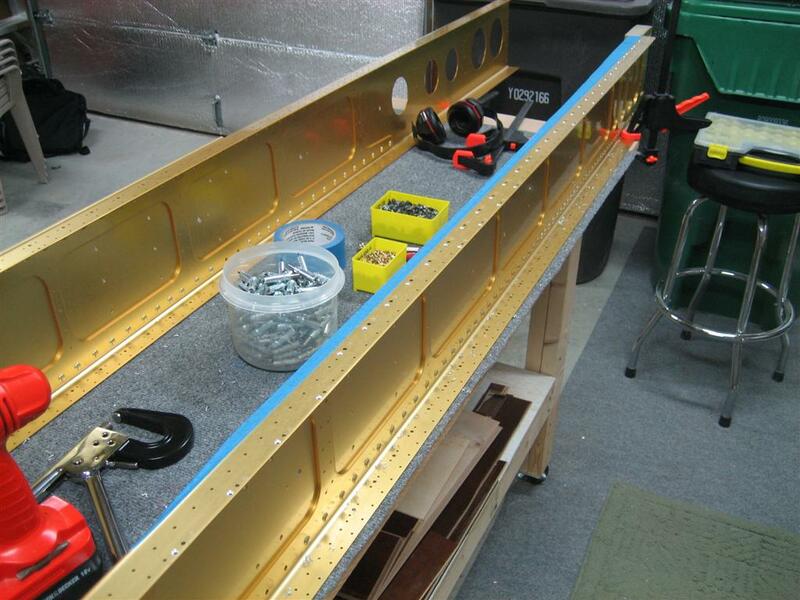 Here is the end of the row, looking back toward the “diagonal” wing-walk attach holes. Bottom flange, sobriety-maintaining Sprite-zero, and the girlfriend's cordless drill I'm borrowing (pronounced "you can have it back when you pry it from my cold, dead hands"). Thanks girlfriend! Next, I grabbed some K1100-08 nutplates, some silver 3/32″ clecos, and some AN426AD3-4 rivets and started getting ready. My plan is to cleco the nutplate to the spar, insert one rivet, then after riveting that one, take the cleco out and rivet the other side. Cleco in one side, unset rivet in the other. 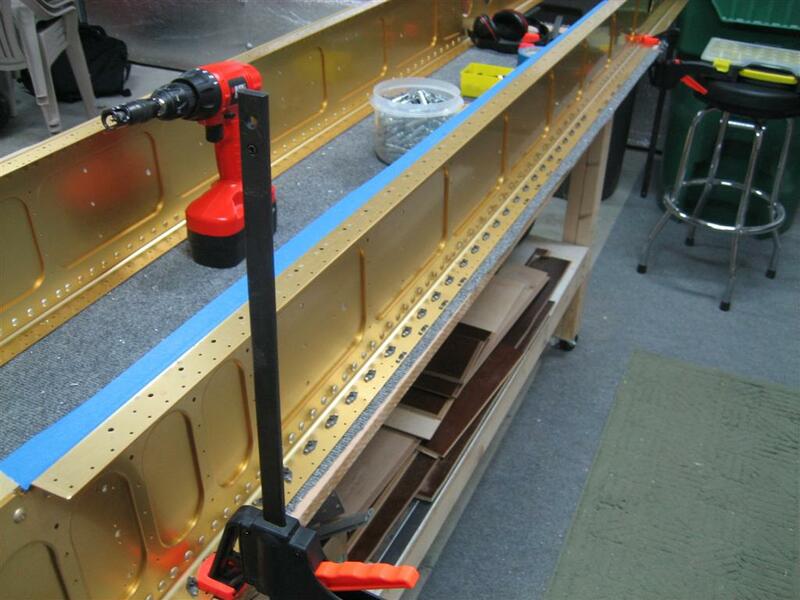 Down the line, everything ready to rivet. Ahh, this slower, more thoughtful approach is paying off. Can you see the error that I almost made? Here's an example nutplate before I take the cleco out and put the other rivet in. I can’t remember why I took this picture. I think I just took out all the clecos, and I thought it looked cool. Ready to set the second half of the rivets. No pictures of the second rivets, but here’s one of the other (now top) flange. You can see all of the nutplates on the lower flange. 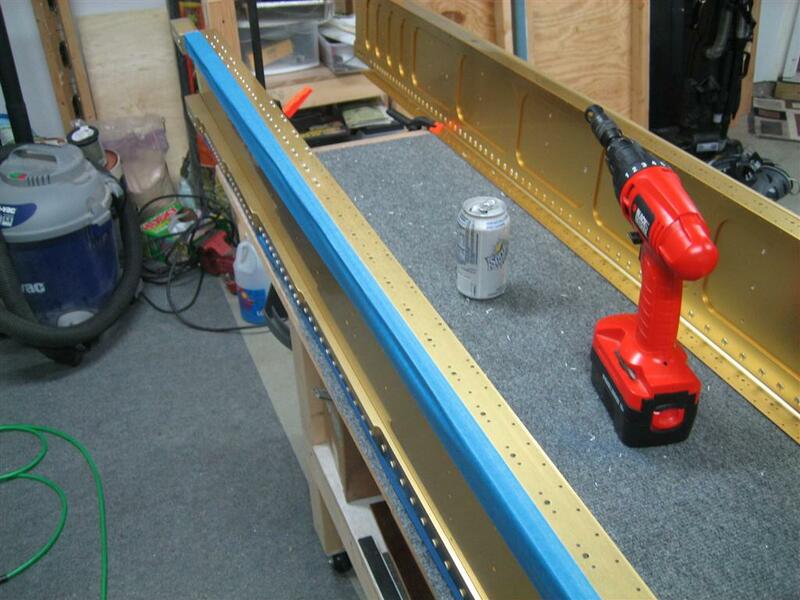 Anyway, I set all the nutplate attach rivets on the upper flange, and then called it a day. 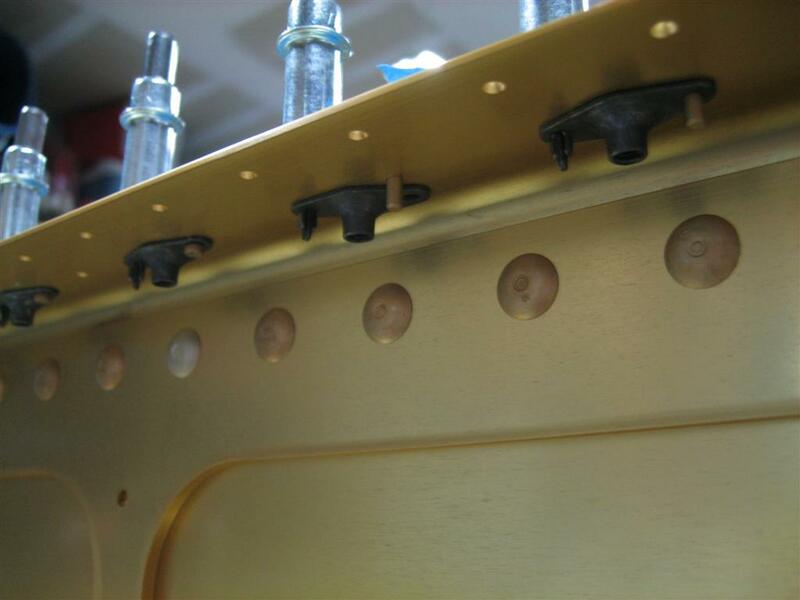 So I got to cross off the two statements in the construction manual I highlighted above, and next up is to use the installed nutplates as c/s pilot guides for countersinking the screw holes. Oh, and then I get to repeat on the other spar. 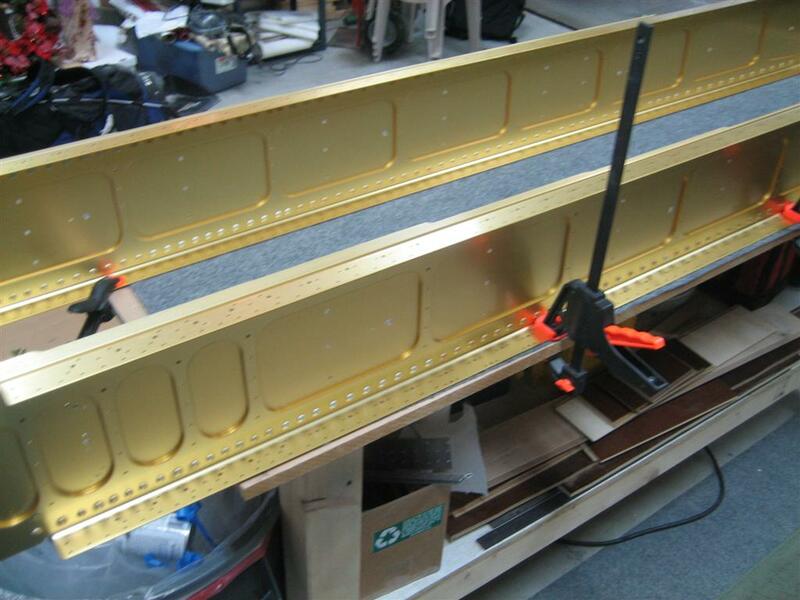 3.5 hours of countersinking and riveting today. 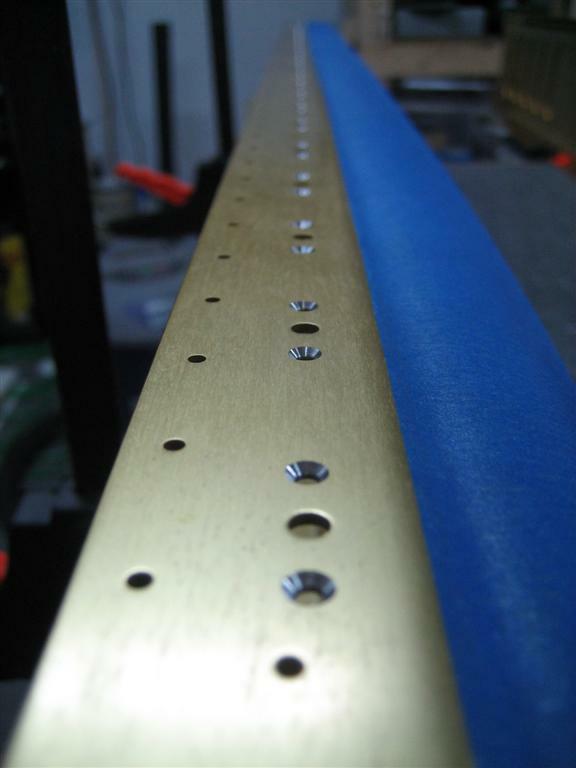 144 rivets, 1 drilled out (the rivet split in two!). Good times. This entry was posted on Sunday, August 22nd, 2010 at 4:30 pm and is filed under Wings. You can follow any responses to this entry through the RSS 2.0 feed. You can leave a response, or trackback from your own site.